The word “earworm” refers to a tune that seems impossible to get out of your head – often, no matter how much you try. Although these may be currently popular songs, oldies, or show tunes, they can also be classical musical works. In the nineteenth century work by Hector Berlioz, he even uses the term idée fixe to refer to a theme in the work itself. Imagine a melody that remains for centuries. There is a melody that has been a part of music for the better part of a millennium. Written in the thirteenth century, the “Dies Irae” (“Day of Wrath”) was one of the handful of sequences to the Mass that survived an abolishment by the church in the latter half of the sixteenth century. It is closely associated with the Requiem Mass. The melody is in a minor mode, beginning on the third and descending to the tonic, generally in evenly timed notes. This tune is so memorable that a reference just to the first four or five notes is enough to recall the melody. Its ominous minor structure is found with some frequency in scores for films and television. In this work scored for very large orchestra, Berlioz has the melody performed by four bassoons and two tubas. There is no doubling at the octave, they are all sounding the same notes. The natural minor melody of the “Dies Irae” plain song is perfectly open, unhindered by anything except the church bells. Later in the final movement, after a new impish melody is introduced, near to the very end, the “Dies Irae” returns, played by almost all of the winds stretching from low C (two octaves below middle C) to high C (two octaves above middle C). A fast jig-like melody is played by all the strings, some in unison and some in harmony. With fifteen or twenty woodwinds and brass playing the “Dies Irae” in two-beat notes, the melody can plainly be heard and recognized. For those learning the art of orchestration, this is a rare example to hear what a melody played in the low range of the bassoons, doubled by the tubas, sounds like. Another interesting feature is Berlioz’s scoring for two timpanists and in this section they even have a short, one-measure, passage where they are playing “in harmony.” While the harmony may not be obvious, the two timpanists playing similar, but slightly antiphonal rhythms, is a tribute to the exemplary imagination of the composer. The Russian composer Sergei Rachmaninoff included the “Dies Irae” more than once in his works. In fact, here are two examples of Rachmaninoff using it in the same piece, Rhapsody on a Theme of Paganini, Op. 43, for piano and orchestra, written in 1934 when the composer/pianist was in his sixties. Although some will know the last of Paganini’s Caprices for violin solo, many know the eighteenth variation of the Rachmaninoff. However, we will be examining the eighth and tenth variations to see how the “Dies Irae” is scored. The first time the “Dies Irae” is introduced is in Variation VII. As can be seen from some other examples, this theme is often associated with the thunder and power of brass, frequently in the lower register. Rachmaninoff decides to introduce it harmonized in the piano solo with pizzicato strings and one bassoon mostly doubling the cello line where the Paganini melody appears in in snippets. 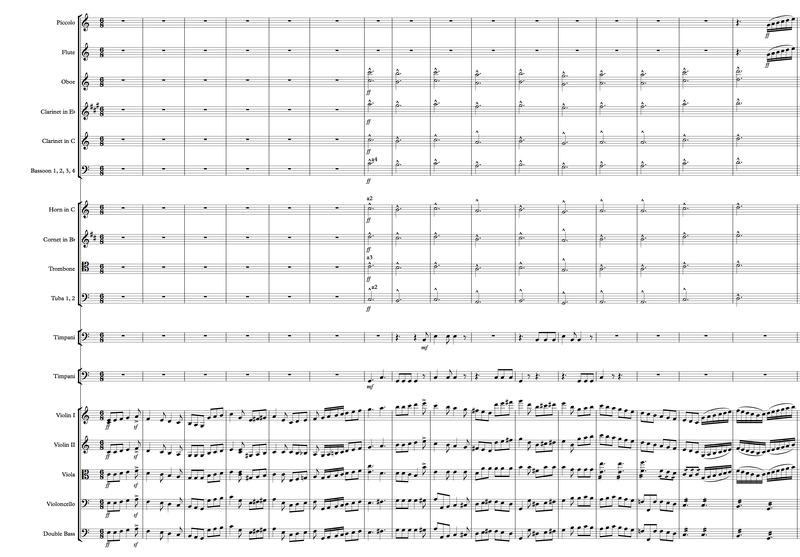 The violins have some little fills based also on the Paganini tune. It’s the piano, though, using block chords in octaves, who plays the “Dies Irae” sostenuto so that the pizzicato strings can be heard with no difficulty, even marked piano. Rachmaninoff’s harmonization of the melody offers nothing unexpected here, but both melodies (Paganini’s and the “Dies Irae”) are served by it. The bassoon might be the most interesting tidbit of this snippet. Although its notes double the cellos, it is the one instrument in the orchestra playing a legato background. Obviously, the piano has the attacks and sustains the chords, but the single bassoon is quietly keeping the emphasis on the Paganini theme, the pizzicato strings supplying the quarter- and eighth-note attacks. Each bassoon segment ends on the downbeat of the next bar thereby highlighting the second beat of that bar in which the lower strings play their notes down one octave. This provides a small rhythmic echo accent to that note similar to the final “bump” note at the end of a large work. The effect is to enhance each two-measure phrase. Through this entire variation, Rachmaninoff adds slightly to the orchestration by bringing in the timpani to support the string pizzicatos. Finally, he adds the horns in half-note octaves to support an inner voice of the piano. Sustained horns often supply the “glue” that ties the orchestra together. More will be discussed about this concept in the future. The ensuing variation in the piece surprises the listener by a sudden increase of the tempo as well as the volume and percussiveness of its arrangement. This is succeeded by a similarly new sound in Variation IX with the strings (col legno) and winds in a syncopated pattern playing the first two notes of eighth-note triplets balanced against bass octaves directly on the second and fourth eighth-notes. When the piece arrives at the second example of the “Dies Irae” in Variation X, the overall feeling is one of power and drive. Rachmaninoff introduces a new sound in the piece. (It is a set of variations, after all.) This time the piano soloist again has the “Dies Irae” melody, but not in block chords, instead, the piano has the melody in three octaves. The rhythm is provided by the strings, horns, bassoons, and clarinets. The Paganini theme has four sixteenth-notes on the weaker beats of the bar (usually on beats 2 and 4). In this variation, it’s the first three beats that are straight downbeats, with the clarinet, then the first violins and flutes providing the descending chromatic run. 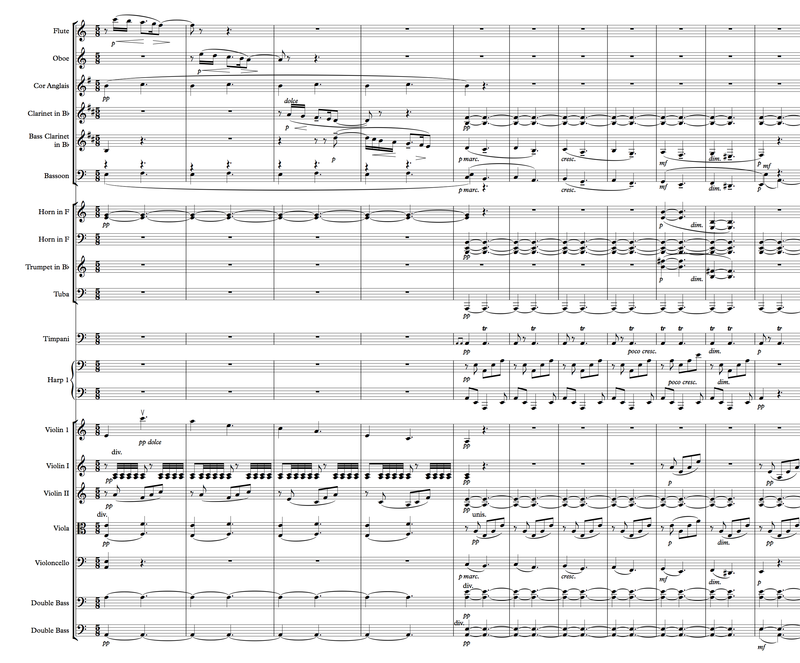 A relatively rare bit of orchestration is the juxtaposition of the clarinets playing quartet notes sostenuto with the bassoons, horns, and strings also playing on the beat, but eight-notes with obvious space (i.e., silence) between them. The effect of this is for the orchestra to support the sustained piano line with the quartet notes and the rest of the orchestra providing the rhythmic percussion. And lastly, note how Rachmaninoff, immediately upon completing the melody with tied whole-notes sustaining the A in four octaves, compresses the melody in the next measure. What had been half-notes are now quarter-notes, sounding very much like the bass line just described. This interesting variation exemplifies one of the techniques used by J. S. Bach and others in fugues and other pieces where variation of a theme are used. In a small way, it foretells one of the techniques Rachmaninoff will use in the well-known Variation XVIII, where he takes the main five-note turn (A-C-B-A-E) and inverts it (A-flat-F-G-flat-A-flat-D-flat). The first example selected from Mahler’s second symphony occurs in the first movement. The strings are playing scale fragments with a staccato eighth and sixteenth-note pattern. 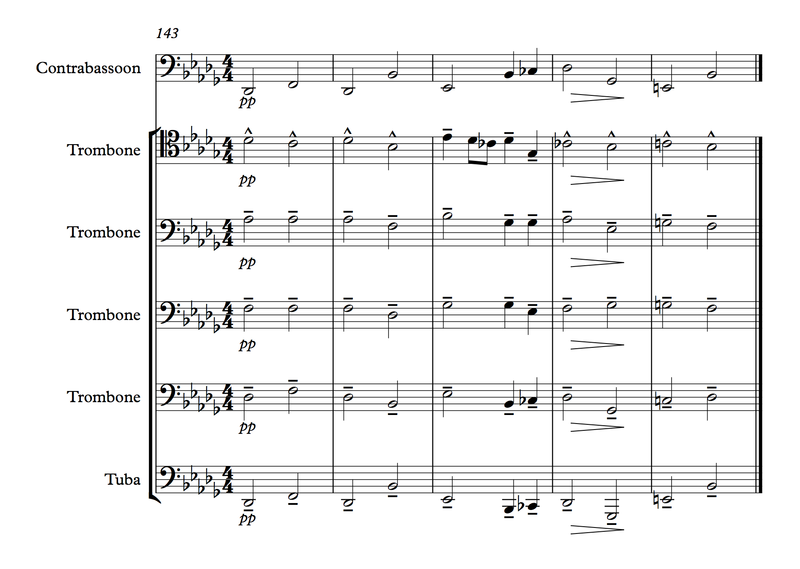 The upper woodwinds are embellishing a pattern of eighth-note, eighth-note triplets, and (similar to the strings) eight-notes and sixteenth-notes. With this open background, Mahler has one trumpet and one trombone playing sustained notes evocative of an earlier melody. When the entire 6-part horn section eventually enters with the first four notes of the “Dies Irae” there’s a transparency that rings clear but also has the function of combining the disparate movements of the strings. The horns are marked mezzo-forte and the strings are all marked pianissimo. However, the passage would still effectively showcase the horns even if the strings were playing at mezzo-forte. Mahler was known in his day as a great conductor. As such his knowledge of the orchestra and the sounds it produces was legendary. 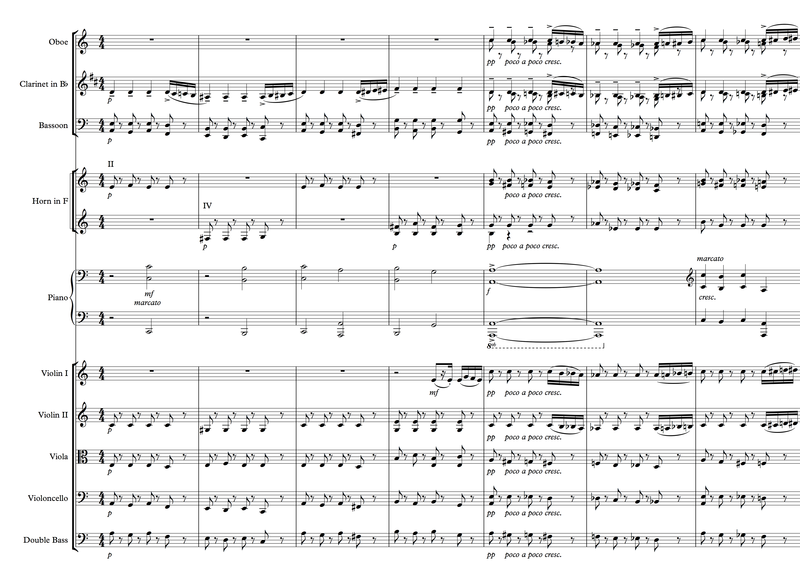 In this next example from the fifth movement, Mahler introduces the four-note “Dies Irae” tune in unison half-notes with the flute, oboe, and clarinet, all marked triple piano. The only other sounds from the orchestra are pizzicato strings playing eighth-notes, first the violas, then ceding to the cellos. 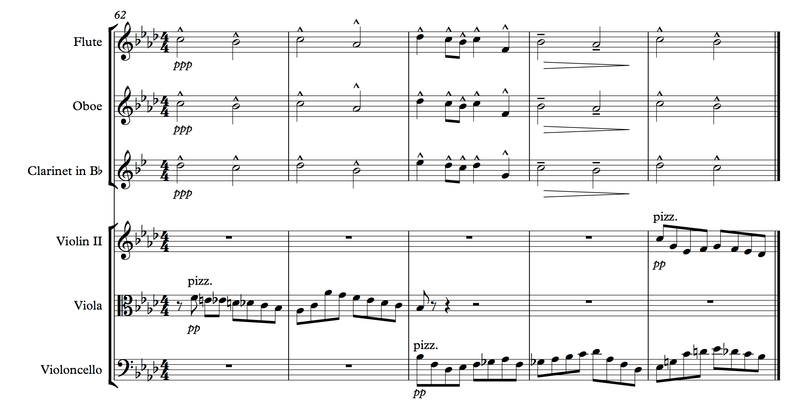 On the last bar of this example, he adds the second violins, playing in harmony with the cellos. This is a beautiful example of how less can be more. The final example, also played softly, is later in the last movement where the melody is harmonized by four trombones and the bass line supplemented with tuba and contrabassoon. Of interest is the range of the trombones. The harmonies are close such that the chords could be played on one hand on the piano. It is in the core of the trombone’s rich central register and evocative of a brass choir in a church service or similar stops in a church organ. What has happened through these examples is that the ominous minor melody has changed with each of its introductions. In the final example we’ll return to that eerie sound presented at the beginning. We earlier listened to the “Dies Irae” used by a 60-something Sergei Rachmaninoff. This final example goes back to a time when the composer was in his thirties. In the piece Isle of the Dead the composer evokes the strokes of the oarsman on a boat taking his passengers to said Isle by using an irregular rhythm of 5/8. Toward the very end of the piece, as we approach the Isle, the winds have an irregularly measured scale descending from the flute on a high C down to the bass clarinet’s C an octave below middle C where the “Dies Irae” enters doubled by a bassoon and the cellos. Although a very quiet passage, there is still rhythmic activity. During the lead-up to the “Dies Irae” the horns and double basses sustain the minor third, A-C. To support this, half of the first violins play this same interval in rhythmic groups of thirty-second notes. In addition, the other half of the first violins are moving down the A minor triad and all the second violins are moving down with eight-note patterns of the two associated chords: A Minor and F Major, simply changed by the viola section’s octaves from E to F.
As the cellos, bassoon and bass clarinet begin the “Dies Irae,” the harp and violas continue the arpeggio support of the second violins. Adding to the solid sustained harmonies are the clarinets, horns, second violins, and four-part divided double basses. The clarinets add a deep, resonant timbre to the harmony supporting the rarely heard divided basses. One last fun touch is the introduction of the timpani, first playing on the one with a roll on the 3-4-5 of the bar. Then, as the “Dies Irae” changes to simply descending thirds, the timpani changes to a sustained roll, getting slightly louder and then, very quickly, diminishing. The impact of this centuries-old earworm is notable. A quick search will show the many examples that were not discussed in the post by other composers such as Bloch, Verdi, Dallapiccola, Gounod, and Tchaikovsky. Because of its associations it is always interesting to note how a composer chooses to deploy this haunting melody.